FOXY is the mascot of Richard's Mobile Tire Sevice. He was conceived in the collective minds of Richard Fox and Harry Varlie. Foxy was derived from Richard's last name (being Fox) and wanting to have a fun and unique logo. After various Artists attempted this project, Harry Varlie's design of Foxy captured its essence and personality. 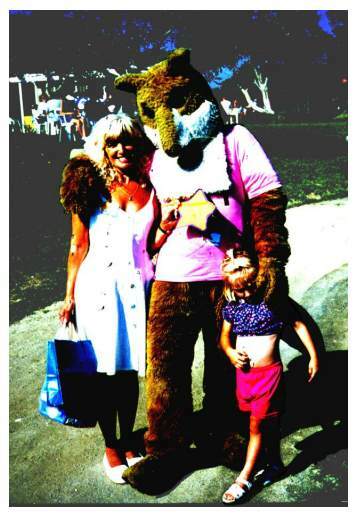 Since that time Foxy has been drawn doing many different things around the community, which gave way for the great idea of Dean Baldridge, namely Foxy the animated costumed character. Now Foxy (7 FT. tall) is alive and well and entertains at many civic events. Foxy is always available to join you at your event. He likes kids very much and loves to celebrate. "Richard" at (760) 450-8473 Foxy can also bring along with him his Monster Truck "High Roller."